Following on its plan to deliver quarterly updates to Star Citizen, Roberts Space Industries and Cloud Imperium Games (CIG) today announced the release of Star Citizen® Alpha 3.1 to its eager fan base. 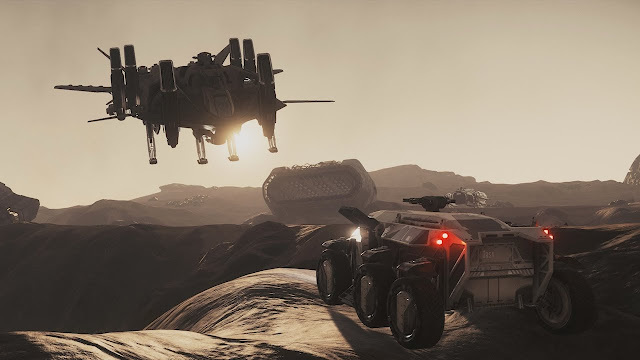 Star Citizen is an epic first-person experience where players fly highly detailed space ships, battle on foot through massive environments, explore life-sized planets and moons, and discover boundless adventure in an ever-changing and expanding galaxy. New features in the 3.1 update include the much-anticipated character customizer, allowing players to add a distinctive look to their in-game avatars by personalizing their physical appearance, as well as the Service Beacon feature, providing players the ability to send out distress calls which other players can detect and respond to. Additionally the development team polished many of the exciting features that launched with the 3.0 patch in December. Updates to the planetary technology, IFCS (flight control), AI, the Personal Manager tool on each player’s mobiGlas, ship weapons, ship damage physics and overall performance optimization, all work in concert to improve the overall Star Citizen gameplay experience. Five new ships and vehicles see their flyable/drivable debut in Alpha 3.1, including Aegis’ heavy salvage ship, the Reclaimer, the Anvil Terrapin-Class exploration vessel, MISC’s dedicated long-distance racer, the Razor, the Nox Kue, a flashy variant of Aopoa’s popular open canopy speedster, and the Tumbril Cyclone, a capable all-terrain ground vehicle. For a downloadable set of assets for Star Citizen Alpha 3.1, please click here. Star Citizen is 100% crowdfunded and was officially announced on October 10, 2012 and is recognized by Guinness World Records as the top crowdfunded game in the world. The game recently surpassed more than two million accounts created by its fans. People interested in backing the project can visit http://robertsspaceindustries.com/pledge.